This article introduces how business starters can use project management to start up their small businesses. First we identify the minimal set of tools that is good enough for small business starters to use. Then we map project management tools to our business start-up process to identify opportunities we can exploit project management. Finally we can create or borrow tools that adhere to the process mapping. There are lots of work can be done in the future for this program, including educating the public basic project management concepts, introducing or creating project management tools to the user and ensure they develop a habit of using them. Entrepreneurs and small businesses are important to economy. This article is to determine what project management skills and tools suitable are optimal for small business starters to ramp up business, manage operations, deliver tailored or bespoke products to customers, and manage innovation and growth. We assume readers have basic knowledge of project management although we will ultimately hope broader audience can benefit from using lite project management skills. This may also be a starting point for a program introducing project management to small and micro businesses, or even to the wider public. This article refers to two literature sources, one is a paper from Turner (Turner, 2011) in PMI Journal, and another is the small start-up business program from a College in Ontario, Canada. To what extent do small micro business use project management both in their mainline business and to manage innovation and growth? What elements of the project management are important for small micro business? Details of innovation project management. Lower Level Description of tools and content generated from the morph of project management and business start-up process. To develop the skillsets, knowledge, and tools, first we will define Project Management Light (PML), derived from PMBOK referencing Turner`s literature. Then we will define a Small Business Start-up Process, for this paper we use the process used by Ontario Self Employment Benefit Program. Afterwards, we will start morphing some of them (demonstrated by the orange area). There are many different ways of morphing the activities and process. We will use table mapping methods commonly used in business and system analysis to start to complete the scope of this article. We would expect simplified project planning and control systems, with simplified reporting mechanisms. We would not expect to see them adopting some of the standard methodologies. We also expect to see people fulfilling several roles on projects, especially in smaller companies. Microsized companies do not employ specialist project managers, and so projects are managed by people with other primary roles, and small and micro-sized companies do not tend to use the recognized tools and techniques of project management. Uses laissez-faire management and egoless team structures; also requires all the team members to be able to do all the work, so it requires homogeneous work and homogeneous teams. Simple form of scope or resource schedule. Some have a simple resource schedule, with dates against their activity list. Others also have a resource schedule with dates against the involvement of named resources. No Formal Team building is needed. Need risk management. The most important project management functionality they applied. Simple appraise the value of projects, Buy or hire, Buy-or-do it yourself, contract management. Basic domain knowledge in their work. The above table shows what elements of the project management are important for small micro business. After the elements of PM Lite are identified, we develop a company profile. This company profile includes the elements they will be using in the business start-up process that is specific to the company. SO how we can tie Business Start-up Process and Project Management Together? How we are going to use project management techniques to manage our business start-up process? There are at least two dimensions I can think of in terms of mixing them two together. 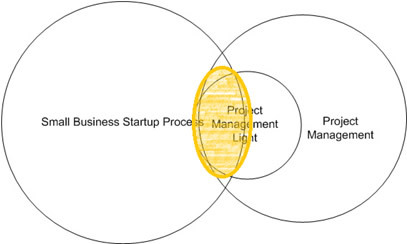 One is Business Start-Up as a project; another is Business Start-Up Process Items and PMLite mapping. For the first one, it is to put the whole business startup process into a master project management schedule. The second one is the for each item inside the process, identify PM concepts or items that would be useful to help executing the tasks. Some of the items can me a project itself. For this example, we choose the Microsoft project start up template as an example to illustrate how we can put business start-up process into a Gannt Chart, Schedule or work breakdown structure. This process has a lot of action item executable to start up the business. Each item has duration, start date, end date, resource, dependencies etc. In this section, we choose the Ontario Self Employment Program Business Start-Up Process. This process focuses on the business planning. However in this plan, there are operation plan and implementation plan that implies activities in execution phase and operation management phase. After the business plan is approved, starters will start-up their businesses based on implementation plan the ultimate goal is to implement an operation that align with the operation plan. You may assume there is a process for business execution and a processes for operation management. Our scope will only do the mapping for the business Planning Process. For each item inside the process, we identify PM concepts or items that would be useful to help executing the tasks. Some of the items can me a project itself. From the above table, we have mapped project management Lite items into business start-up process. 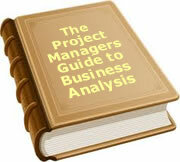 There are lots we can use about project management into our business start-up. For example communication management and client requirement are needed when we talk about networking, sales, or even marketing. For operation management and implementation, we need to use work schedule, work breakdown structure, Gantt chart, tracking, monitoring, activity lists, PM software to help delivering our jobs. For sales, pricing, financial plan, we can use cost management tools to forecast, plan, track, report, monitor our financial and sales activities. For risk management plan, we will leverage PM risk management techniques and tools such as risk register, impact and probability tool, risk identification, risk response planning, risk monitoring etc. For the business description, identifying the business idea, we can focus on using milestones, visions defining techniques. Of course the mapping is not enough. We need to use it. SO how can we use project management? We can develop tools and practices for ourselves and can stick using them. There are many tools you can develop and you can use, and many tools have been developed. 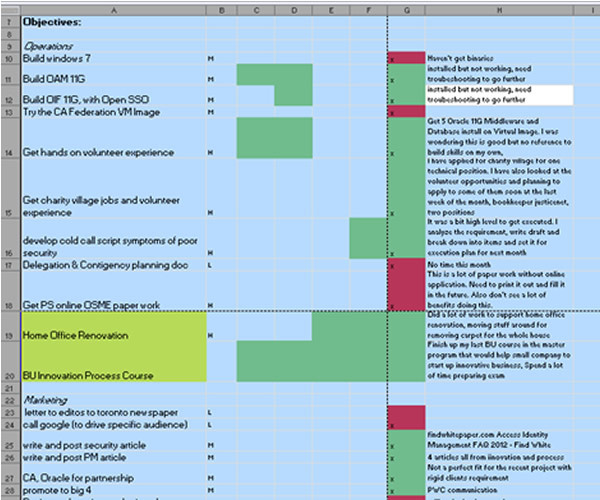 Tools can be spread sheets, checklist, application, document etc. You can be as creative as you need. The whole point here is to use them. For this article, I will use one of my self-created tools to track my activities. Above is a snapshot of one of the tools. This is to identify, schedule, track, prioritize and report my business start-up activities during my project execution phase. This is rather simple, simpler than project office work breakdown structure and Gantt chart. It does not have duration and dependencies. From the left there are activity lists or work breakdown. Then it has priority for execution. On the next following column, it identifies the tasks should be executed in which during the month. After the tasks have finished you fill the box green. Yellow for in progress and red for not finished. On the far right column you put comments and status update of the item. This can be served as an issue log. Also you can extract this column and the first work item column for monthly reporting. I found this tool handy and it is very easy to make and use. The most important thing is to create a habit of using it and stick to your plan. This article introduces how business starters can use project management to start up their small businesses. First we identify the minimal set of tools that is good enough for small business starters to use. Then we map the project management tools to our business start-up process to identify opportunities we can exploit project management. Finally we can create or borrow tools that adhere to the process mapping. There are lots of work can be done in the future for this program, including educating the public basic project management concepts, introducing or creating project management tools to the user and ensure they develop habit of using them.